Somehow I can't wrap my head around a female-fronted AC/DC cover band. Yet that's how Austria's Cil City got its start. But pop singers Celine Dion and Anastacia did do a cover You Shook Me All Night Long for the 2008 Grammy Awards (which was dutifully ripped by most of the music press at the time). Breaking that stream of consciousness, the female-fronted Cil City has moved on to doing original material. They dropped their first album Red Ocean in 2015. Now the five piece returns with Jump Off The Cliff, a short album of eight songs running about 35 minutes. First, too assure your confidence, you can toss the AC/DC reference aside. Cil City plays melodic hard and heavy rock, but they do not sound like a female AC/DC. Make the sign of the cross, and be thankful for small things. In their tunes you'll find plenty of melody, vocal and guitar harmony, and a big beat and groove from the rhythm section. Actually, I found the bass and drum lines to be quite dramatic. 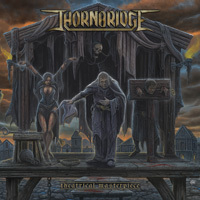 You get something of a metal edge to a Cil City song, thanks to the sharp power riffs. These are topped off by killer guitar solos. At the microphone, Deniz Malatyali is a force to be reckoned with. She has strong voice, not only singing clean and melodic, but also with power, passion, and control. On the last song, #8, her soaring voice will make the hairs stand up on the back of your neck. If she ever left the band, the band would be done. Period. She's that good. As for the songs, as said earlier, they're hard and heavy rockers, wrapped in melody and groove, with more than a little AOR accessibility. Stand outs come with Freedom, Shout It Out, and the first single, Jump Off The Cliff. With This Road Won't Take You Home, Cil City trips you up with a light voice and acoustic guitar start over a bass line, before developing into a heavy steady rocker. A true ballad comes with #8, a melancholy song which features Ms Malatyali's voice over acoustic guitar. 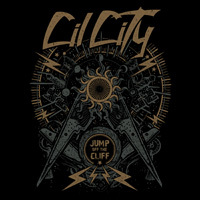 Simply, Cil City's Jump Off The Cliff is a fine album of well-crafted hard and heavy melodic rock, only it's too short. More please. Recommended. 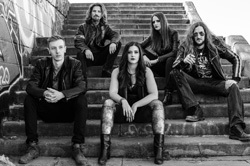 Cil City's Jump Off The Cliff is a fine album of well-crafted hard and heavy melodic rock, only it's too short. More please. Recommended.